The most versatile paddles ever designed! I talked to Mike, from Peliton Plastics, in Valdosta, Georgia regarding our Assault hand paddle mold tooling. Mike had originally explained that they were going to have the mold made at one of their other (sister) machine shops in Kentucky. His Georgia tooling shop was behind schedule on other tooling projects and it would be months before starting our project. The machine shop in Kentucky has been making blow molds for Peliton all along. He felt they could handle a pressure injection mold. The Kentucky crew would be able to start the project a.s.a.p. I understood and appreciated their time and consideration. It seems from the get-go that this mold tooling project was challenging. 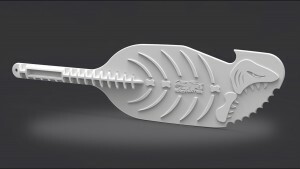 First, the physical size of the Assault hand paddle mold was very considerable. A billet of aluminum required for that size of mold could not be procured in a timely fashion. So they procured a billet of “tool steel” instead. Better yet! A steel mold will produce about 1 million paddles, where aluminum will only yield about 100,000 paddles. The Assault paddle is physically large by their tooling standards, and also has the raised detailed graphic package on the blade faces. The Kentucky CAD tooling program quickly was overwhelmed with the file date size. Mike and Corey (Kentucky machinist) have been daily trying to break the file down into workable sections, but that has been very time consuming. The tooling machine can only cut a few hours per day as they re-write the files to accommodate their smaller cad program. The tooling machine should be cutting at least 18 hours per day to stay on schedule. Nevertheless, the Kentuckycrew have had to purchase an upgrade to their cad system program to run our detailed files and complete this project in a timely manner. As with any new program, there is a learning curve and they expect to get all the bugs worked out by next week. Also noted was all the raised graphics on the blades, and the intricate contours of the graphics, especially in and around the logo, is a time consuming machining process. The tooling has to be done at a much slower and meticulous pace, with many manual bit size changes. Being the mold is now made from “tool steel” vs. aluminum, the cutting takes about 10x longer, as the steel is so much harder to cut. With all this having been said…we are only 40% complete on the Assault mold. Once they get their new cad program all synched up, the project should move along much faster. I will be getting an update again in a week or so. I appreciate your patience, time and consideration my friends!! This entry was posted in Backwater Paddle Products, Marketing My Company and tagged Assault Hand Paddle, Backwater Paddle Company, kayak paddles on August 30, 2012 by Paddleman. Just talked to the mold builder for the Assault Hand Paddle and said it will be another 3 weeks or so. We are looking at the end of August now! Backwater Paddle Company appreciates all your time, consideration and patience in seeing this project to fruition! It has been an eye opening experience in tackling the Assault Hand Paddle project. Our future projects will, hopefully, move along a lot smoother. We just have to get the wrinkles out of our manufacturing network. This entry was posted in Backwater Paddle Products and tagged Assault Hand Paddle, Backwater Paddle Company, kayak fishing on August 10, 2012 by Paddleman.